The Beard Team USA Blog: Der König lebt wieder! Readers of this blog will recall my report on the demise of the King of the Wild West Moustache Division, Günter Rosin. (Pronounced "Roe-zeen.") Günter had enjoyed a winning streak longer than anyone could remember but to everyone's shock was dethroned in Berlin, where he had to settle for second place. It turns out my report on the King's demise was premature. Since Berlin, Günter has won every competition that has been held, including the European championships in Amberg. Günter has told me the secret of his success, which I am not at liberty to disclose, but in my opionion the real reason for his success is no secret. Günter is an all-around cool guy who embodies perfection and style in every way. 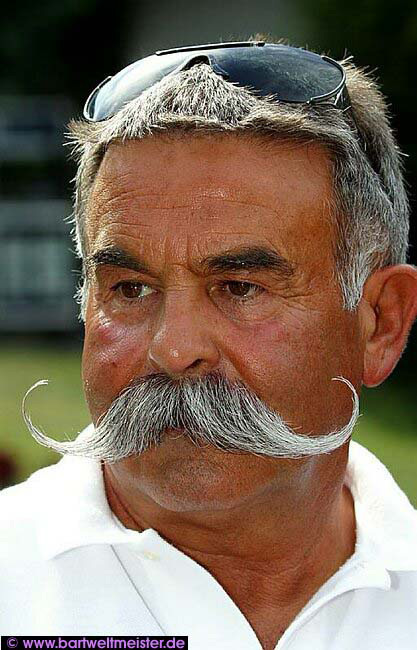 Moustache wearers worldwide should bow down to the King!